Aproveche la molestia de planificar su viaje a Machu Picchu con este tour de 2 días desde Cusco, ideal para quienes visitan por primera vez y a las familias. Pre-reservar un tour garantiza la entrada al sitio Inca, declarado Patrimonio de la Humanidad por la UNESCO, que limita los visitantes diarios. Viajarás cómodamente y disfrutarás de una visita guiada a Machu Picchu y de tiempo libre para explorar por tu cuenta. Su tour incluye comidas, una noche de alojamiento y recogida y devolución en el hotel. Viaje en carro desde Cusco a Machu Picchu en dos días. Entrada incluida en el precio del tour, por lo que su boleto está garantizado. Una gran opción para quienes visitan por primera vez y familias. Transporte de ida y vuelta desde su hotel en Cusco incluido. We were visited by 2 representatives of Machupicchu VIP Tours, tour operators, the night before the tour at our hotel. They encouraged us to cancel our Viator reservation and go with their offer. We did not. Our Viator voucher stated Machu Picchu By CAR 2 days. We were picked up by taxi in the morning and transferred to a bus with more than 15 people. What was included on our voucher Transport, Cusco-hydroelectric-Cusco Food-01 breakfast, 01 lunch, 01 dinner 01 night in HOTEL in Aguas Calientes Entrance to Machu Picchu professional guide to visit Machu Picchu. 1 Not by Car. 2 No hydroelectric. 3 Food was as listed. 4 We were put up in a HOSTAL not HOTEL. I called Viator emergency because we had no guidance or tour guide to meet us at Aguas Calientes. Viator should have that call documented. Thank you Viator for your assistance. 5 Entrance as stated. 6 Guide met us at Hostal at 5:45am and waited in line with us for bus to reach Machu Picchu . Guided tour, when reaching top of Machu Picchu, was 1 1/2 hours and covered only one side. Oh, he did indeed do a video of the three of us, but we were not told it was for rating purposes of company service and guided tour. He left shortly after that. We paid for hydroelectric back to meet the bus which dropped us short of San Francisco Square after 9pm. We then called a taxi to reach our hotel. So much for VIP service that we paid for. Viator and TripAdvisor need to be aware of this company's practices, they do not deliver as advertised. In fact, they try to get us to cancel Viators paid tour 100 non refundable and try to get us to buy their tour. The rating of one star is for the food and 1 1/2 hr tour guide. I will also advise TripAdvisor of tour experience. They met with me the night before (past cancellation refund point) to tell me that it is a 3 hour walk from the hydroelectric station to Aguas calientes, or you have to purchase train tickets. There is no hotel provided, it is a hostel. 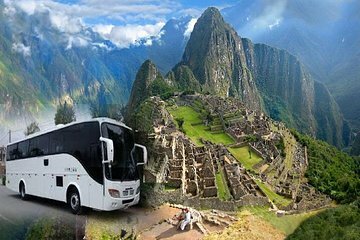 You then have to purchase addition bus tickets to and from Machu Picchu. Better off buying an all inclusive day tour.